The Los Angeles Design Challenge has been won with a car that most Americans have learned to ignore: the smart, which is made by Mercedes-Benz. 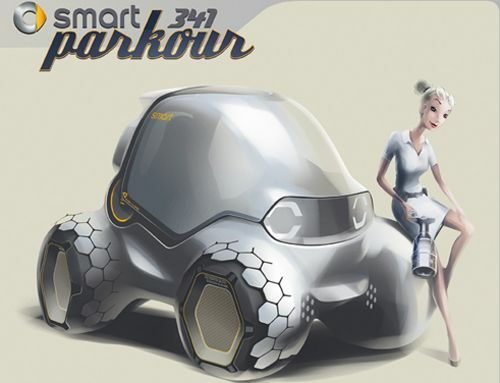 This is the second year in a row designers for smart have won the competition. The design challenge has become an important part of the Los Angeles Auto Show among automotive designers with a win considered a feather in the designers' caps. Teams from Honda, Hyundai, Mercedes-Benz, Maybach and Subaru competed in addition to smart (obviously Mercedes puts a lot of faith in this contest with three of the competing teams having ties to Stuttgart). The theme of this year's design challenge was "the most spectacular new film car for Hollywood." It's important to note that these design exercises are just that: exercises. They are not focused on building real-world vehicles – at least nothing that is going to be built in the next decade. This year's Los Angeles Design Challenge was not just about developing the Hollywood car of the future, but also about inventing a story worthy of Hollywood. "With the 341 Parkour smart hit the nail on the head: the design combines innovation and functionality with an exciting film plot" is how the jury consisting of multi-discipline design professionals justified their decision. It is judged by four leading design experts: Mark West, Transportation Chair of Detroit’s College for Creative Studies; Tom Matano, Director, Industrial Design, Academy of Art University; Stewart Reed, Chair, Transportation Design, Art Center College of Design; and Jay Shuster, Art Director, Pixar Animation Studios. Entries are judged based on various factors including: how the vehicle reflects its brand attributes relative to the movie plot; how the vehicle relates to the targeted audience or brand; the level of imagination; the character development of the vehicle; and the uniqueness of the combination of story, car and character. With the smart 341 Parkour the Mercedes-Benz designers created a revolutionary super all-rounder with a completely transparent passenger cell for maximum all-round visibility. Designers said it can drive normally on the roads, climb up the façade of skyscrapers and even fly. In the accompanying story, this is the vehicle that reporter Annie Angle sets off in to research her first title story which she hopes will kick-start her career. She has read in the newspaper that the incredible "smart Granny Robots" have gone missing and sets off to find them. While the designers are given credit, Sylvain Wehnert, Emiel Burki, Phillipp Haban, Mercedes did not announce who the screenplay writers are. For the film story the designers took up the visionary smart concept that won them first place in the Los Angeles Design Challenge last year. Then the smart 454 was knitted from carbon fiber by "smart Granny Robots". The film for Mercedes-Benz “Silver Lightning” has been awarded as “Best Animation”. Several features enable Annie to take pictures from the best possible locations and help win the Los Angeles Design Challenge. The large greenhouse gives her 360 degrees of visibility while traveling through the inner city. The wheels are retractable and contain impulse pads and vacuum cups. The hexagon skin around the wheelhouse is adjustable to release the wheels. The smart has different modes: a typical drive mode, a fly mode that allows the vehicle to hover far above the streets and a climb mode that allows the vehicle to run up the walls of skyscrapers.